Valentine’s Sugar Cookies- The best sugar cookies! Soft and chewy, with a delicious buttercream frosting. First off, I just want to say Happy Birthday to my awesome husband, Derek! I love him so much and am so happy we have each other forever! 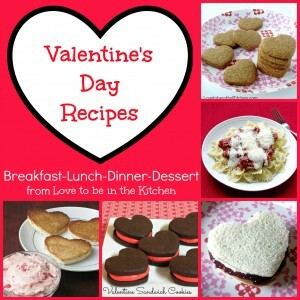 Speaking of love… these heart-shaped cookies are not only super cute but so good! Seriously the best sugar cookies ever! I’ve had a lot of sugar cookies in my life and these are the best. They are soft and chewy, just as a good sugar cookie should be! I’ve had too many hard sugar cookies in my life so I am thankful I now have a go to amazing sugar cookie recipe! These sugar cookies + buttercream = heaven! I love February mostly because of Valentine’s Day. I love all the hearts and cute pink/red things. And it’s my favorite time of year to make sugar cookies. The heart shape is so adorable, romantic and fun! 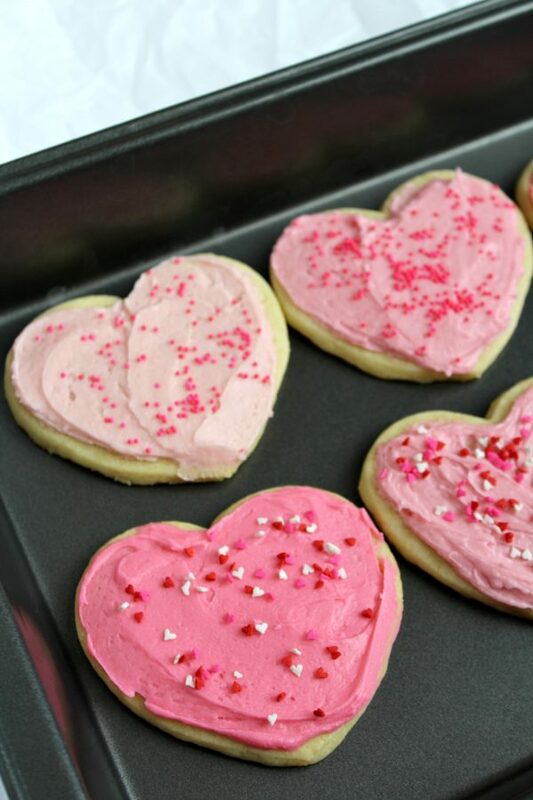 I made a whole batch of these heart-shaped sugar cookies and buttercream frosting and had our neighbors over for a fun Valentine’s Day activity decorating them. It was great to get to know each other better and enjoy these yummy cookies! I love this sugar cookie recipe because it’s so basic but so good! The cookies are soft and chewy and so addicting! Then to add the perfect touch, the buttercream frosting just makes these the perfect frosted sugar cookie you’ve ever had! Sift together flour, baking powder, and salt. Set aside. Place butter and sugar in large bowl of electric stand mixer and beat until light in color (2-3 minutes). Add egg, milk and vanilla and beat to combine. Put mixer on low speed, gradually add flour, and beat until mixture pulls away from the side of the bowl. Roll to 1/4 inch thickness between two sheets of parchment or wax paper. After rolling, chill the dough for at least 30 minutes to an hour. Once the dough is well chilled and hard to the touch, cut out shapes and place them on a silicone mat or parchment-lined baking sheet about 1 inch apart. Bake at 375 degrees F for 6-8 minutes, rotating cookie sheet halfway through baking time. Do not over bake. The cookies will look a little underdone but that is ok. It will set up as it cools and result in a soft and chewy cookie. Let sit on baking sheet for 2 minutes after removal from oven and then move to complete cooling on wire rack. Store in airtight container for up to 1 week. *Tip: Place cookie sheet with the cookie dough shapes in the freezer for 15 minutes before baking to help the cookies not to spread too much. Mix the powdered sugar, butter, and milk together until smooth. Add the extract and food coloring, if using until blended well. *If you want to use chocolate frosting here is the link: Chocolate Buttercream Frosting. I recommend only making 1/4-1/2 the recipe because it makes a lot. « Cookie Dough That’s Safe to Eat! These cookies are SO delicious! Thank you so much for sharing with us. I especially loved the chocolate buttercream! Yum!! !